Inviting you for a Free Talk with Dr. Nandita Shah of SHARAN, an organization which is at the forefront of lifestyle disease prevention and reversal through Nutrition. She will deliver a Health Talk on the very popular topic of ‘Detox & Weight loss’. Learn how to eliminate toxins from your body and also achieve a healthy weight loss by eating more! About Dr. Nandita Shah: Dr. Nandita is a sought-after Speaker, Author and Winner of Nari Shakti award from President of India for her pioneering work in the field of Health and Nutrition. She has inspired thousands of people across the World. 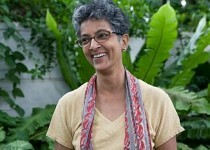 One evening with Dr. Nandita can transform your life. Don’t miss the opportunity. Any queries, Whatsapp or Call Ram on 050-7457295. The Talk is Free. Prior registration is required to attend. (limited seats).